Harwood has some company. Last weekend, the ever-busy Matt Solensky was able to tag another adult male snowy north of Fargo, ND, in almost the same spot where he’d caught Harwood the weekend before. 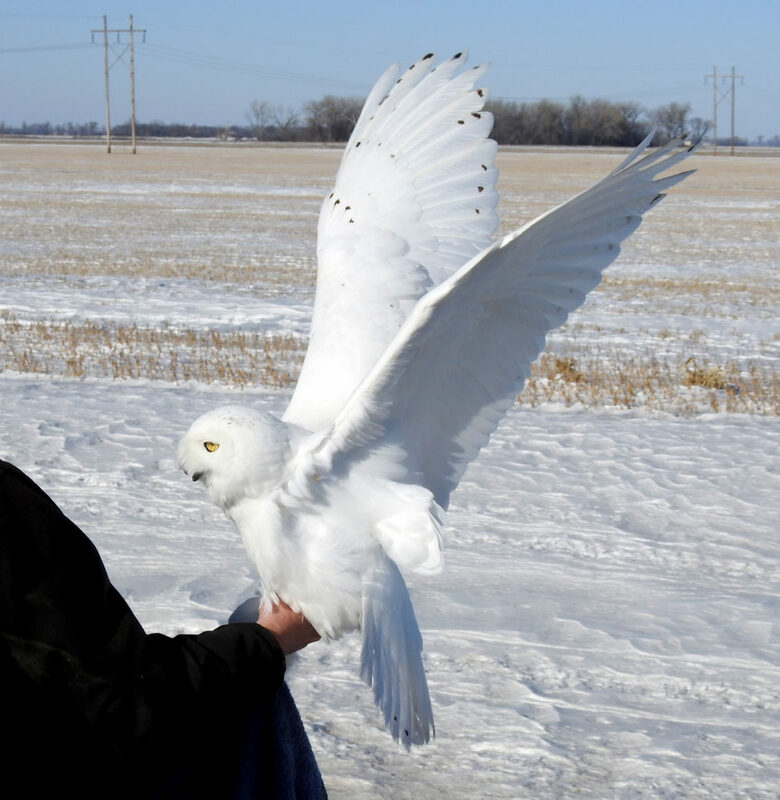 On Friday, Jan. 19, Matt got a call from Dan Mason, one of the Fargo-area birders who have been so helpful in finding snowy owls. Dan had seen a bird perched on the same billboards along I-29 where Harwood was caught, but couldn’t see a transmitter and thought it was a different bird. Matt was skeptical, but decided to head out the next day to try. Saturday morning, Matt quickly found a snowy perched on top of a high pole. “It was a bit far, but I thought it was worth a shot. It wasn’t,” he said. “A couple hours and a visit from a bored county deputy later, I picked up the traps and moved on.” He had a similarly poor response from a second owl he located, and so decided to investigate the spot Dan had mentioned — especially after emailing me from the road to ask me to check Harwood’s tracking data, which made clear that the owl Dan had spied was, in fact, a different bird. Matt set up a trap, then waited for 40 minutes before the owl made a pass. It was a miss, but the owl came back repeatedly until he was finally caught. The bird was extremely white and, based on his wing molt, at least five years old. Matt dubbed him Argus, for the nearby town of Argusville, ND. “Interestingly, I looked at Dan’s pictures and compared them to Argus and it was not him.” What’s more, Matt found yet another snowy nearby the next day, a much darker bird than any he’d seen, but wasn’t able to get it. So there are at least four owls along the interstate near the towns of Harwood and Argusville, two of them sending us data — and perhaps we’ll have more, if Matt keeps up his run of luck. As was the case last winter in Wisconsin, we’re hopeful we’ll be able to see how multiple owls share the same landscape and interact with each other — and we’re fulfilling our goal of increasing the number of tagged owls we’ve tracked in prairie/Great Plains habitats, to balance the robust coastal/Great Lakes data set we have. Argus’ map and tracking data will be up soon — stay tuned! What a beautiful bird! I am so envious of those who can actually see these winter visitors on the roof tops, signal lights or whatever. They are so lucky. Argus is one handsome Snowy Owl! A perfect name for this glorious male. Silver. I love to think of all this data coming out of Fargo, where I have some very fond memories. What a beautiful bird – than you Project SnowStorm and members for the good work that you do!! Great news about Argus – what a beautiful bird! Looking forward to learning how the snowies interact. Argus is a beautiful snowy. Thanks so much to Project Snowstorm for letting us watch. Beautiful Bird. They you for your help at Project Snow Storm. Beautiful! Curious as to how you catch them? Thank you! Depends on the situation. Most of the owls we tag are caught in a bownet, which is a large, spring-action clap net about four feet across. Because we’re working with raptors with several times the visual acuity of humans, we must use live lure animals (gerbils, Russian hamsters, pigeons) but they are in a small cage and the owl can’t reach them. We also use a bal-chatri trap, which is lightweight wire cage (attached via a bungee cord to a weight, so it can be safely dragged but can’t be carried off) with several heavy monofilament nooses that catch the owl’s foot. Our twin concerns are the safety and well-being of the owl, and that of our lure animals. Airports sometimes use what’s known as a Swedish goshawk trap, a large wooden-and-mesh structure that looks a lot like a simple house with a peaked roof. The lower “house” section holds the lure, usually a couple of pigeons. The upper spring-loaded “roof” opens wide to either side, and when the raptor drops in to try to get its prey, the owl bumps a trigger bar and the roof closes — owl on one level, pigeons safely below. We don’t use Swedes, however, because they’re not portable. Welcome Argus! 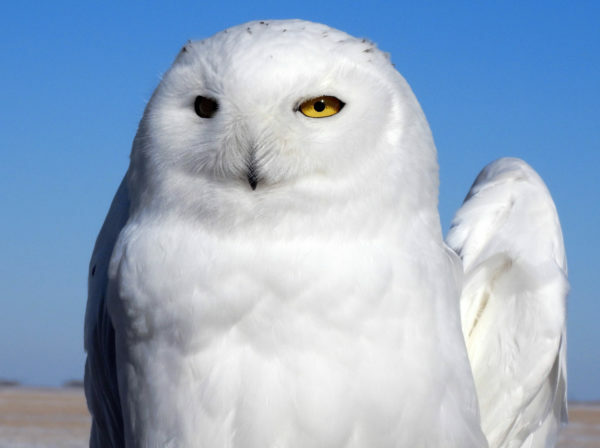 What a beautiful snowy owl, reminds me of Hardscrabble :) Today we’re going to look for him, haven’t been last weekend due to bad weather (and a bad cold). It will be interesting to see the interactions of the Fargo area owls!